He may be trying to call dibs on the furniture. If your dog can't seem to resist rubbing and grinding his body all over your furniture, the solution isn't to lose your patience -- or to invest in lint rollers. He has a reason, and it could even be a medical one, so pay attention when he starts rubbing away. Your dog's sense of smell could be his motivation for rubbing against the furniture, and in one of two ways. First, he could be marking his territory -- by rubbing against an object like your couch, he deposits his natural odor and identifies the object as his own. The second motivator is the opposite: Instead of trying to deposit a smell, he's trying to pick one up. When a dog smells something he likes, be it your loveseat, your dirty laundry or a fresh pile of animal waste, he may find it hard to resist rubbing himself all over it. Some dogs rub themselves on the furniture -- and practically everything else -- after a bath. This isn't a form of rebellion, but rather a response to the potentially uncomfortable consequences of being bathed. A dog's fur and skin are coated with natural oils that keep him from becoming too dry, which is why you should not bathe a dog more often than is recommended (the ideal frequency varies from breed to breed). If he's bathed too often, or if you use a product that dries out his skin, it can leave him itchy and uncomfortable -- and the best way to scratch that itch may be rubbing against your furniture. 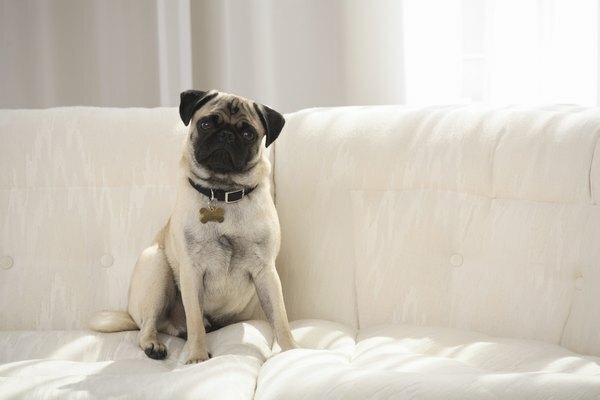 When your dog habitually rubs the furniture, it could be a sign that he needs to see a vet. The itchy, irritated skin that leads to this behavior may be caused by medical conditions like skin infections or parasitic infestations. Ringworm, fleas, mange and yeast infections are just a few conditions that will lead your dog to feverishly rubbing against anything he can find in search of relief. Even if he doesn't have an infection or an infestation, other conditions -- medical and psychological -- can compel your dog to rub the furniture. If he rubs his face against it, for example, he may be attempting to clean gunk out of his eyes -- especially if he just woke up from some beauty rest. Food allergies can also make his skin irritated, so if he's recently switched foods, he may need to switch back. And of course, plain old boredom and stress can manifest in unusual behaviors, too. Obsessive behavior like constant licking, furniture rubbing or circling can be signs of psychological distress.